If you have a plan to be using solar energy and be away from the power grid, it is very important for you to know well the pros and cons of the grid system. The grid system which is in off mode also called standalone power system is when there is sufficient electricity produced at home through other means like gas generators to fulfill the demand and it does not require to be connected or be dependent on the main power grid. This system takes you further by being green in terms of electricity, it does not matter whether you choose to connect your electric generating system to main grid or not. From the point of efficiency these are considered the second most effective for some of the families who have either to cut their electricity usage or build a system which gives them sufficient electricity to meet their demands. 1) It is definitely a cheaper solution to reduce your home electricity consumption if you reside in an area where the cost is very high to get connected to the main grid. 2) No more energy bills to pay at the end of the month. 3) You do not have to ask any permission or seek approvals from the energy authorities anymore. 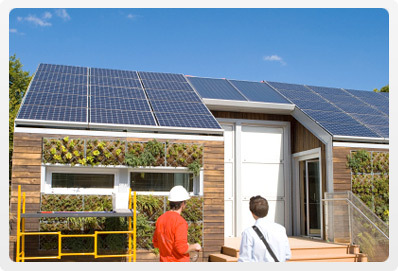 4) The set up and the maintenance costs are very less as compared a home solar with grid system with battery backup. 5) Off grid system would inspire people in your home to make efficient use of electricity and also develop healthy habits among the children. 1) The supply of the power may be limited, unless you have large Photovoltaic (PV) system to produce enough power to meet your demands. 2) This has total dependence on the weather conditions. The insufficient number of solar panels to capture the during dull sunlight days or not having enough wind spreads to run your wind turbines may give you difficult times. 3) The battery storage life may be short in an off grid system, since these are the prime source of storage. Different seasons will also affect the efficiency especially for those houses which are located there. For the people who live in an area where generous amounts of sunlight are available round the year, they will have peace of mind. The houses which are located in the areas where there are different seasons are greatly affected. Off grid system also helps you to help the planet by reducing carbon footprint; additionally you can save lot of money which otherwise you would spend on electricity companies. The energy costs are increasing day by day, this also has an adverse effect on the planet, we must explore other sources of energy which is clean, renewable and is abundantly available. There is lot of power being generated by other means such as wind energy, geothermal etc. Such initiatives need to be encouraged so that people use these alternate energy sources by investing minimum amount to save the energy costs and also contribute to the welfare of our planet.